In the European Parliament, MEPs have voted narrowly to reject plans to bolster the price of carbon in the EU ETS by delaying or ‘backloading’ the sale of 900 million carbon allowances, prompting accusations that they have badly dented the bloc’s reputation as a global leader in the fight against climate change. The proposals were defeated in by 334-315, forcing the plan to return to the committee stage. It is now expected that the price of carbon allowances will hit record lows in the next few days as the market responds to confirmation that short to medium-term action is unlikely to be taken to address the chronic oversupply of carbon allowances in the market. Trading after the vote saw the price of EU allowances (EUAs) fall to a new record low of €2.63 a tonne. The EC proposals to remove the 900 million allowances, in order to boost the price, were defeated by a coalition of mainly centre-right MEPs (saying it would be interference with the market-based mechanism and could lead to higher energy bills in some markets) and also climate sceptic MEPs (some UK Conservatives), who have rejected any steps to try and tackle climate change. MEPs have voted narrowly to reject plans to bolster the price of carbon in the EU’s emissions trading scheme (ETS) by delaying or ‘backloading’ the sale of 900 million carbon allowances, prompting accusations that they have badly dented the bloc’s reputation as a global leader in the fight against climate change. The proposals were defeated in by 334-315, forcing the plan to return to the committee stage. Analysts are now predicting the price of carbon will hit record lows in the next few days as the market responds to confirmation that short to medium-term action is unlikely to be taken to address the chronic oversupply of carbon allowances in the market. Trading in the immediate aftermath of the vote saw the price of EU allowances (EUAs) fall from more than €4.50 a tonne to a new record low of €2.63 a tonne. The European Commission proposals were defeated by a coalition of mainly centre-right MEPs who opposed the plans on the grounds they would represent interference with the market-based mechanism and could lead to higher energy bills in some markets. Their numbers were also boosted by climate sceptic MEPs, who have rejected any steps to try and tackle climate change. A number of British Conservative MEPs are understood to have defied Prime Minister David Cameron to vote against the proposals. Businesses and green groups that had been campaigning in support of the plan were left deeply disappointed by the vote. NGOs have consistently warned that the rejection of the ‘backloading’ plan would not only lead to a further collapse in the price of carbon, but would also undermine confidence in the EU’s wider climate change programmes. Analysts and campaigners had also warned that the failure to approve the backloading plan would make it extremely difficult for the European Commission to push through wider-ranging reforms designed to permanently address the oversupply of carbon allowances in the EU ETS. In addition, energy and climate ministers of Germany, France, Italy, the UK, Sweden and Denmark warned that the rejection of the plan would significantly increase the likelihood of individual member states pursuing their own carbon taxes, such as the UK’s controversial carbon floor price. Attention will now turn to the European Commission’s wider package of reforms designed to tackle over supply in the carbon market through the permanent retirement of excess carbon allowances, tighter limits on the number of carbon offsets that can be used in the market, or lower emissions caps on those firms covered by the scheme. However, analysts said rapid progress on the package of reforms is unlikely to materialise, and warned that the market is now unlikely to see any fundamental changes until 2015 at the earliest. But EU Climate Commissioner Connie Hedegaard insisted the vote had left the door open for earlier action to support the carbon market. “The commission of course regrets that the European Parliament has not approved the backloading proposal,” she said in a statement. “However, it is worth noting that when it was suggested in the second vote that the parliament finalised its rejection right away, this was not supported. The result of today’s vote will lead to renewed calls from businesses, green groups and politicians for the EU to reach a decision on climate-related targets for the post-2020 period. Negotiations have been ongoing for months on the nature of any new targets, with member states understood to be divided on the scale of any emissions targets for 2030 and whether or not to repeat the package of targets for 2020 and impose new targets for energy efficiency and renewable energy. Miles Austin, executive director of the Carbon Markets and Investors Association (CMIA), expressed frustration at the result of the vote. His comments were echoed by Guy Newey, head of environment and energy at the Policy Exchange think tank, who urged MEPs to now redouble efforts to deliver more comprehensive reforms to the ETS. “Scuffling over short-term, temporary measures is a sideshow compared to the need for real reform of the ETS and Europe’s wider approach to climate,” he said. “That is where political attention must be focused. 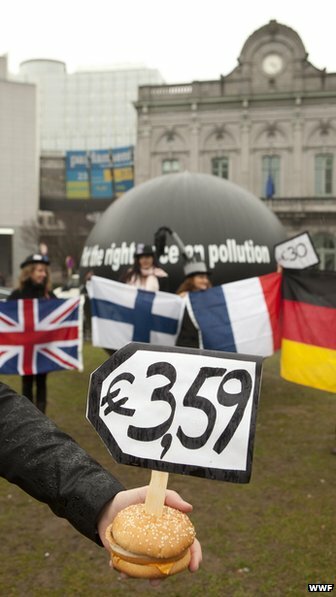 The European Parliament has rejected a plan to rescue the EU’s ailing carbon trading scheme. Members narrowly voted against a so-called “backloading” proposal that would have cut the huge surplus of allowances currently being traded. The price of carbon has fluctuated considerably since the ETS was launched in 2005. The scheme limits the emissions from around 12,000 power plants and factories across the 27-member bloc. At one point the trading price was well above €30 per tonne But concerns over the growing number of allowances issued has caused a significant drop in recent years. In January this year it hovered around €3 per tonne. In an effort to push up the price and make low carbon investments more attractive the European Commission proposed withholding around 900 million allowances from the market over the next two years. The hope was that this “backloading” proposal would promote scarcity and would drive up the price. The move was backed by a number of European energy companies which placed a full page advertisement in the Financial Times urging a “yes” vote in the Parliament. But industries that use a large amount of energy were angered by the proposal. They said that the low price of carbon accurately reflected the economic reality of a Europe struggling with a slump for the past four years. They said that backloading would put many companies at a significant competitive disadvantage to businesses in the US which have benefitted from lower energy costs thanks to shale gas. Despite political backing from the UK, France and Italy, MEPs voted against the proposal by 334 votes to 315 with more than 60 abstentions. It will now go back to the Parliament’s environment committee for further consideration. Poland’s minster for the environment, Marcin Korolec, welcomed the move in a tweet. “The vote of reason,” he wrote. However there was anger about the actions of UK Conservative MEPs. Twenty two Tory members voted against the backloading idea. Chris Davies is the Lib Dem spokesman on environment in the European Parliament. He said the actions of the Conservatives undermined the efforts of the coalition government to protect the environment. “Conservative MEPs could have made a decisive difference and levelled the playing field for UK manufacturers building car parts, aerospace technologies and other energy intensive export businesses. “Instead they have let their hatred of the EU get in the way of their own party policy and of economic growth. The EU Commissioner for climate action, Connie Hedegaard said the she regretted that backloading had been rejected. ”Europe needs a robust carbon market to meet our climate targets and spur innovation,” she said in a statement. Some environmental groups were furious that the plan had been rejected. According to Joss Garman, political director of Greenpeace UK, it cast doubt on the future of the scheme. “The central plank of Europe’s strategy for cutting carbon emissions is now rendered impotent as it won’t stop a single dirty coal plant from being built,” he said. The future of the ETS in Europe the short term looks pretty bleak – the carbon price has already fallen by close to a half, from an already rock bottom level, as the market absorbs the news that the Parliament has voted against throttling back some of the supply into the already overloaded market. The immediate implications of this are that forthcoming auctions may struggle to go ahead as technical reserve prices, intended to prevent sales significantly below the market price, could kick in as they already have before in Greece and Austria. This could serve as sort of stop-start temporary ‘backloading’ but it unlikely to lift prices by very much. Member States who have been banking on incomes from auctions to fund public services or supporting green policies will find they have a hole in their finances and this could prompt the introduction of more carbon taxes to compensate – as was recently introduced in the UK. This will be bad for business as the once level carbon playing field across Europe starts to splinter distorting trade. The low prices are also bad news for Europe’s more efficient, well-run companies who will no longer be rewarded for doing the right thing. In the short run it’s also bad for the two thirds or so of installations currently holding comfortable surpluses as there will be no-one interested in buying their spare allowances, removing a source of income at a time when all potential cash flow represents a potential lifeline. In the medium term, there is the possibility that a different, more ambitious proposal will emerge from the Council, Commission or indeed the Parliament. There were a number of abstentions in the vote today – if they can articulate what their concerns were and have them addressed, something new could emerge. Equally, some members of one of the most powerful blocks the EPP have claimed they do support fixing the ETS just not through backloading so they may support a different approach if one can be agreed on. There is a slim chance something could be agreed ahead of the next parliamentary elections in May next year. If that fails then it will be two years or more before anything can be done at an EU level. In the longer term the ETS will simply carry on regardless as there is nothing in the legislation that causes it to cease. By around 2020 much of the industrial surpluses will have run out and future free allocations to industry will be fast disappearing. Offsetting provisions will also run out. So if the policy does not change then prices will inevitably rise again in about 10 years or so. Sadly for the EU, to sit around doing very little for the rest of the decade means loss of investment and sends a very bad signal – especially in the run up to the 2015 UN negotiations when the world is meant to try and agree the next international treaty. For this reason it seems likely the focus of the Commission will now shift to deciding climate targets for 2030 which if they are accompanied by changes in the ETS trajectory could serve to lift the carbon price from the doldrums a lot earlier than it would otherwise. Posted: Wednesday, April 17th, 2013. Filed in Climate Change News, Recent News.